With the increasing number of releases now on 45rpm, this section is getting busier. So keep checking back. This is the first record release of 2018 for Bamboozle, with two more 45’s and a full CD scheduled. The ‘A’ side is a cover of Imelda May’s ‘Mayhem’, a powerhouse version, respectful to the original , and delivered vocally and musically with reverential gusto. The ‘B’ side, ‘Daddy’s Girl’ is an original tune by Serena Sykes, and it’s kind of a Rockabilly meets Western Swing amalgamation, with some harmony backing vocals, including Keith Wilkinson, to enhance it further. Love the addition of pedal steel from Dave Kirk too, which complements Jim Knowler’s ace lead guitar work. A peach of a tune. Super cool release, consolidating the band’s reputation, and well packaged with some futuristic artwork. Looking forward to the next one! Marcel Riesco, has been at the forefront of the Rock n Roll scene for a number of years now, since the Truly Lover Trio album ‘Bullseye’ hit the decks. His enthusiastic vocal delivery, deft guitar work and uncanny Roy Orbison-esque lilt to his voice, has made him a worldwide hot ticket. This 45rpm vinyl single, contains two tracks, including the title track, from the upcoming album, ‘All Shades of Blue’. The ‘A’ side of this Sleazy Records 7", is a cover of the Morgan Twins’ 1958 ‘B’ side (to ‘TV Hop’) on RCA Records, ‘Let’s Get Goin’. Written by Melvin Endsley, this reworking really rocks, and works very well with Marcel’s solo vocal. Good dance floor jiver this one. Flip the record over and you have a change is tempo, with Marcel’s own composition, ‘All Shades of Blue’. This is three and a half minutes of gorgeousness, with his voice so perfectly pitched, you can’t help but think that it’s an old Orbison song, in the ‘In Dreams’ echelon. Well crafted lyrics with an excellent vocal quality and tone, and the characteristic Riesco sounding guitar accompaniment. Woo woo Baby! Yeah it’s Dale Hawkins, the exhilarating Shreveport Louisiana rocker, and a tip top Bear Family 45rpm, showcasing two excellent tracks. As you’d expect, it’s very well packaged with informative notes on the sleeve from Bill Dahl. ‘Boogie Woogie Teenage Girl’ is a beaut of a track, simple lyrically and set to a striding bass line from Willie Dixon. Great guitar work and vocal harmonies from Margaret and Rose Lewis. A latter day classic that surprisingly wasn’t released until compilation CDs were on the market. Roy Buchanan’s searing guitar licks open up ‘Lulu’, which has a raw blues sound, and solid stroll beat, and although first recorded in ’59, the notes state it wasn’t released until ’76. The sound is as hot as that summer was. Two top drawer tracks, on one well packaged 7”. 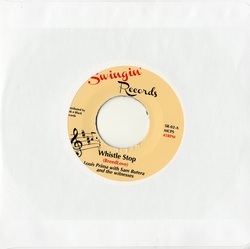 Ruby Records, follow up their top drawer debut release by Big Sandy and the Fly-Rite Boys with this second 45rpm by one of the most talented guitarists and gifted songwriters from Australia, Pat Capocci. In addition to the classic Rockabilly trio sound, there’s the clever addition of Ezra Lee’s deft piano work on side A, ‘Coming In Hot’. This track has a pacey rhythm, just the right amount of reverb on the vocals and some superb guitar work, set to a cleverly worked ‘start-stop’ style. Side B, ‘Burn It Down Baby’, is simply an ace piece of rocking blues. Thumping beat set by bass and drums with classic blues guitar work, that put me in mind of Lightnin’ Hopkins. This is your stick on dance floor bop track. Play it loud! An excellent release, which given how high Big Sandy had set the bar, was going to be tricky to emulate, however Pat’s 45 is up there too. Checking out the classy artwork of this EP’s sleeve, I kind of had an idea of what to expect from the songs. And I wasn’t disappointed, as it’s a raucous romp through four kickin’ original tracks. ‘Tombstone Rock’ starts with a thumping drum beat, before the rest of the lads tear into the song. Plenty of screams, shouts, a searing guitar instrumental break, and it ends as it started, with the drum beat slowing down to an accompanying shriek, akin to Screamin’ Jay Hawkins. ‘Pocket Pistol’ keeps the pace up, incorporating piano as well, in a Rock ‘n’ Roll tear up, which has influences of ‘School of Rock n Roll’ with it’s frantic velocity, and no nonsense vocal delivery. Flip the record over, and ‘What’s Wrong With Me’ is a solid chunk of electrically charged Rockabilly, and showcases once again, the versatility of Hipbone Slim/Sir Bald’s guitar prowess. A slight reduction in tempo from the breathless hustle of side A, which is a mere breather, leading into the final track. ‘Hubabubabub’ is plain nuts! Thumping bass beat and heavily reverb-ed vocals, the subject of which defy explanation, other than to say it’s a rip roaring two and a quarter minutes track, that you will love, but won’t quite know why. Sir Bald, is backed by Bash Brand on drums, Gez Gerrard on bass and on a couple of the tracks, Slim Cyder on piano. This release takes no prisoners, and is loud, proud and above all, ace! The Netherlands over the years has produced some excellent Rock n Roll talent, and up there with the best is Hans Nelemans, who goes by the stage name RJ. His time performing with the Phantoms, the Tri-Tones and most recently the Swampshakers, showcase his classic Rockabilly lead vocal style. This eight track release on 10” vinyl is packaged in an extremely well designed sleeve, coloured excellent artwork on the front and effective black and white on the reverse. The only thing that you will notice is that the track listing is slightly mixed up, as the title track ‘Girl by the Pool’ opens up the record. This track is an ace stroller, with a bluesy feel to it, welcome piano accompaniment and a super sax break. ‘Hollywood Hop’, is the title track of RJ’s EP that you can also read about on this section of the website. It was recorded around three years ago and features Arthur Skropnik who co wrote it, and Mariann Lants of the Tri-Tones from Estonia. 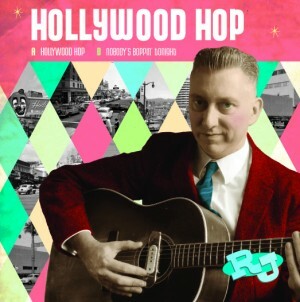 ‘Hollywood Hop’ rattles along apace to the acoustic guitar rhythm, and a catchy bass line. Good lead guitar work on this full sounding bopper. ‘Don’t Worry About Me Baby’, despite being a rather melancholy subject, is a catchy tune, set to a striding bass line with a jazz-meets-Rockabilly lead guitar break. ‘DJ Rock n Roll’ is straight ahead boppin’ Rockabilly, with slightly distorted vocals which add to the authenticity of the sound. Flipping over to the ‘B’ side, and it’s the only cover on the record, Peggy Lee’s 1961 cut ‘Love Being Here With You’, which I have to say is a first rate version, very different but respectful to the original, with some consummate jazz guitar breaks and rhythms throughout. A complete contrast follows, in the shape of ‘All Right All Right’, a real thigh slapping, foot stomper of a track, and like a number on this record, a collaboration between RJ and Arthur Skropnik. Recorded in March 2014, RJ teams up with Rolf Hartogs, who takes up lead guitar duties to excellent effect on ‘Red Head’. There’s slightly more reverb on the vocals, and a different guitar sound, but another peach of a track. And topping it all off, ‘Nobody’s Boppin’ Tonight’, which is slightly ironic, as this whole album has a dance vibe and timbre that will get you out your seats and on the floor. This is a well conceived album, the sound is sharp and the rhythms varied to suit a diversity of tastes. Top stuff! An attractively packaged EP arrived the other day, from Brazil. Rock n Roll transcends all barriers it seems, and thanks to social media, I was able to get a copy of this beauty of a release by Joanatan Richard and his Beatful Boys. His bio suggests that Joanatan takes a lot of his influences from a healthily diverse selection of artists, from Elvis to Johnny Kidd, the Shadows to Rudy Tutti Grayzell. His music is a melting pot of these and other favourites, opening up with the title track ‘Hey Everybody’. This is a pacey rocker, with a bouncing bass beat and a feel good rhythm. Track two, has a country ramble feel to it ‘I’m Not Here Just For Business’, I could hear Johnny Cash doing this one, it’s a sound steeped in Western authenticity. Flip over the 45, and sample the thumping bass and sax accompaniment to a corking Rockabilly sound on ‘God Gave Me The Music’. I loved the lead guitar and wailing sax breaks on this one, as well as the sentiment of the lyrics, expertly delivered. Finally we have ‘1,2,3,4, Once More’, which is a slightly gentler paced Rockabilly number, driven along by rhythm and lead guitars. This four tracker is hugely enjoyable, showcasing not only the quality of music from Joanatan and his band, but his talent for song writing and vocal delivery in a different language to his mother tongue. Great stuff. What do you get when you combine the musical talents of an Italian jumping R&B band with one of the top female vocalists of the genre? A peach of a 45rpm release on the Elegante Music label. Laura B has been at the top of the R&B tree for some years now, and collaborates with Benny “The Cat” Pretolani to co-write both songs on the record. The ‘A’ side ‘Deep Down In My Soul’, is a cracking dance floor jive tune. The sound is full, the beat and rhythm is so infectious. It’s pacey and Laura’s vocal delivery is perfect against the six piece band’s tight and adept accompaniment, with the talents of each musician individually showcased. Flip the single over, and you have the second of the Pretolani/B compositions, ‘The White Prayer’. Another stick on favourite with jivers and toe tappers alike with it’s driving rhythm and stop-start style. Ace Benny, sax break, complemented by “Slim” Pintori’s Hammond solo and Marco Gisfredi’s guitar licks. Which is best? I don’t think you could choose. Musically it’s excellent, vocally exceptional, and the packaging features eye catching artwork in temperate and highly effective colours, by Andrea Monis. This has to be among the best R&B releases of the year so far. There’s a new record label on the block, Ruby Records, featuring the combined input of Tom Ingram (Viva Las Vegas et al) and Ana Catarina (Ruby Ann). This is their debut 45rpm release, and what a beauty it is. In the truest sense of ‘go big or go home’, they have the force of nature that is Big Sandy, and his Fly-Rite Boys to celebrate the creation and launch of the label. First thing you’ll notice is the accomplished artwork by the experienced Gito Lima. It is, however all about the music. What do you expect from Big Sandy? Quality? Of course, and he has it in amounts that would fill those two cases he’s carrying on the cover of the record. ‘Fine Fine Superfine’, is a stick on jive dancefloor winner, and has a George Jones feel for me. Sandy is on top form here vocally, and the ‘Boys are spot on, backing. The ‘B’ side, is a lyrical beauty ‘Every Time’. This is vintage sounding Big Sandy, who seems to get better with every release. Great vocal delivery, thumping bass & drum beat and ace lead guitar break. A real foot stomper, that I guarantee you’ll love. In fact I’d suggest, that whether you’re new to Big Sandy, or a die hard fan of twenty years plus, this release will be up with your favourite ‘today’ recordings. Ruby Records, are specialising in vinyl releases, and believe me, they have set the bar really high with this debut! An exquisitely presented EP arrived recently from Vee Tone Records. A shrink wrapped 7” picture sleeve featuring Justin Tubb against a light blue background. Within, is another record sleeve, containing a most vivid yellow chunk of vinyl. Place it on the deck and enjoy the ‘Nashville Radio Sessions’. The eldest son of Texas Troubadour, the legendary Ernest Tubb, Justin recorded these tracks around 1956, for short military funded recruitment programs, and to date, they were never released. Four true golden nuggets, that thanks to Vee Tone are now available for everyone to appreciate. ‘You Nearly Lose Your Mind’, was in fact written by Justin’s father, and a studio version was recorded in 1956. This is a corking rocker, that has a foot in each of the Hillbilly and Rockabilly camps, and an infectious beat, complementing Justin’s adept vocals. Track two, written by a certain ‘Everly’, yes that one, ‘It Takes a Lot O’ Heart’ is a fine ballad, about young love, and the first steps therein. Flip the record over and track one ‘Lucky Lucky Someone Else’ is Justin’s reworking of a Marty Robbins composition, and a tale of lost love. Excellent ballad this with super steel and fiddle solos. A studio version of the song was released in 1956. Finally, a treat, that was never released as a studio recording, George Jones’ ‘All I Want To Do’, which Justin delivers in fine style. It’s short, and certainly sweet. This release has quality stamped all over it, the physical product, the packaging and the quality of the sound. A music lover’s, and collector’s dream. Vee Tone Records, have done it again, this time with a 45rpm, featuring the same song, by the same artist on both sides of the record. This is Glenn Douglas’ ‘Let It Roll’, a peach of a song, presented Hillbilly, and Rockabilly style. Firstly though, you will notice the rich and bright orange colour of the vinyl, and the quality of the product. Pop it on and listen to the ‘A’ side, the Hillbilly version. It really is a floor filling bopper, that I reckon DJs would clamour for, and the quality of the sound is exceptional. On the flip, the stripped down Rockabilly version, that was apparently recorded for a radio show. It’s slightly shorter in length, the fiddles have been replaced with a guitar solo, and although a little basic sounding, it’s still top drawer. There’s a 500 press limit to this edition, and I’m glad I’ve got one of them! Dutch rocker, Hans Jus D’Orange, under his stage name of RJ, recently released a fine four track EP, packaged in a fetching gate-fold sleeve, including brightly coloured artwork and photography. This handsome chunk of vinyl is all original material, written by RJ and various assistants, who also join him musically on the record. The A side was recorded nearly three years ago and features Arthur Skropnik who co wrote the two songs, and Mariann Lants of the Tri-Tones from Estonia. The title track, ‘Hollywood Hop’ rattles along apace to the zippy acoustic guitar rhythm, and a catchy bass line. Good lead guitar work on this full sounding bopper. That theme continues with the up-tempo rocker ‘Nobody’s Boppin’ Tonight’, a bright and bouncy bop tune, despite the disappointed tone of the lyrics, reflecting a situation many of us would have found ourselves in! The ‘B’ side brace of tunes were recorded in March 2014, and pairs RJ with Rolf Hartogs, who takes up lead guitar duties to excellent effect on ‘Red Head’. There’s a slightly different vibe to the ‘A’ side, slightly more reverb on the vocals, and a different guitar sound, but another peach of a track. Last but certainly by no means least, is ‘All Right All Right’, a tip top foot stomper, again with a thumping bass beat and ace lead guitar runs. Mickey Lee Lane appears on one side of this Swan 45rpm, with an instrumental ‘Tracks To Your Mind’. Most notable for his floor filling bopper ‘Senior Class’ and soul stroller ‘Hey Sah Lo Ney’ from ’65, this stroll sounding tune has the latter named track’s feel about it. Scotty McKay the alternative name to a former Bluecap, Max Lipscombe had a solo career from which the B side of this 45rpm is taken. ‘Midnight Cryin Time’ comes from 1960, originally released with ‘A Little Lump Of Sugar’. This already has extensive airplay at clubs and weekenders, and will be immediately familiar to many. A great DJ pairing. Every now and then, a review record comes through the post and I’ve no idea who released, or re-released it for that matter. Such is the Pye Records 45rpm that contained on the ‘A’ side ‘My Colour is Blue’ by Nicky James from 1963. It’s a good uptempo tune demonstrating the blend of sixties beat with the sound of a few years before. Tommy Scott & The Senators well that’s Tom Jones, having recorded ‘Baby I’m In Love’ in 1963 with a Joe Meek arrangement. Meek released ‘Chills and Fever’ and ‘Baby I’m in Love’ in 1965. This is another tunes that takes influences from the time it was recorded and the Rock n Roll era of the 50’s. If you like your Rock n Roll on the cusp so to speak, you’ll like this one. The test of a good band is partly how they perform and cover the classics for sure, but also the quality of their own material. So with four tracks on their own label, Jack and the Real Deals serve up a quartet of crackers on this 7”. Formed as recently as 2011, the band are making waves on the club scene, and ‘Moth To a Flame’ has had several outings to great acclaim already. This is a well written uptempo Rockabilly bopper, featuring Sid’s deft fret work on the solos. ‘All I Want Is You’ is a stick on dancefloor stroller, with additional saxophone backing as well. Flip the record over and there’s a top bopper in the shape of ‘Joker’s Wild’, featuring some additional vocals to Jack’s. Rounding off the release is ‘Chain Gun Blues’, another well written slice of Rockabilly. Chuy and the Bobcats from San Fernando, L.A, feature Jesus Felix on rhythm guitar and vocals. His style is almost haunting, prominent on this Wild Records title ‘Strange Dreams’, which is a well presented stroller written by the man himself. ‘Lovin’ Arms’ has a hopped up ‘Blue Moon Baby’ feel to it and features some exemplary guitar work from Santiago Bermudez who also wrote the track. There’s a real low down and dirty sound on Craig Shaw and the Illuminators’ ‘I Believe’ on Wild Records. It features a growling guitar beat, vocals delivered through a microphone with some distortion, and wailing harmonica solos. The ‘B’ side nudges the early 1960’s R&B sound and indeed the title ‘Twist and Bop’ suggests what you might expect to hear. This is another of Craig Shaw’s own compositions, which will certainly be popular on the dancefloors, late at night in clubs. The ‘B’ side ‘Closed For Repairs’ is also a Mejuto original, and features him in fine vocal fettle on this cracking stroller, despite the rather melancholy subject of the lyrics. First class. From the city of Bourges in central France on the Yèvre river come the Wild Goners, and their single on Wild Records, ‘Big Time Mama’. This an authentic sounding four piece with nearly twenty years experience recording and performing Rockabilly around the world. This track rocks along wonderfully and sounds just like it came out of 1956. One is fun, but two must be a treat, especially when two 45rpms arrive at the same time from guitar ace Pat Capocci. Hailing from New South Wales in Australia, this guitar slinger never disappoints with either stage shows or recorded material. ‘Slave For The Beat’ and ‘Deliquent Beat’ released on 45rpm, were as a result of a collaboration between Wild Records and Press-Tone Records. The second single ‘Firefly’ is a sumptuous house rocking, slide guitar driven foot stomper, written by Pat and featuring the vocal talents of the Rhythm Shakers’ Marlene Perez. Lovers of the up tempo Muddy Waters and Elmore James sound will adore this. Justifiably so, as the whole experience is one you will want to live over and over. Turning the record over, we have a treat of an instrumental, ‘Chicken Hawk Walk’, which has a bit of a Dale Hawkins feel to it. First class stroll beat on this track as well, showcasing Pat Capocci’s undoubted guitar skill. The rise to prominence of Scotty Baker from Australia his almost being meteoric. Two CDs and headlining performances at Britain’s Rockabilly Rave, and shows in America have propelled him to the upper echelons. The ‘B’ side, is another lyrically adept track ‘Secret Mistress’, set to a stroll beat, details the shenanigans involved with a love triangle. Top vocal delivery on this track with expert backing from the band. Santos’ latest Wild Records release ‘Gotta Move’ on 7” is a maraca shaking beauty of a track, set to a classic bopping beat, perfect for Santos’ vocal delivery. It has everything you’d want from a late 50’s sounding Rockabilly record. Flip the single over and ‘Ought To Know’ will fire up the dance floor for the strollers. Thumping drum beat and searing guitar solo on this well produced 45rpm. 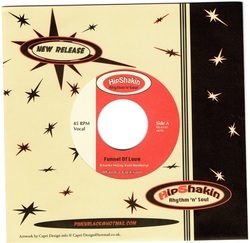 Hip Shakin’ Rhythm ‘n’ Soul records, part of Perry Williamson’s Pink’n’Black records label, has issued the first of what is to become a series of 7” singles. Kicking off the collection are two tried and tested dancefloor winning tunes from two equally popular artists. Paul Ansell’s Number Nine take the ‘A’ side with a great jiver, ‘I Got a Feeling’, a hopped up version of the Big Maybelle classic, that has a great rhythm and groove to it. This is backed by the classic stroller ‘Have Love, Will Travel’ by Big Sandy, recorded expertly, with it’s catchy tagline and lyrics. Since the 2009 CD ‘Jubilee Cocktail’, Italian songstress Rockin’ Bonnie has been out on the live scene performing all over Europe. Finally she has got back into the studio, along with new official band, the Mighty Ropers. There are two originals and two covers on the four track EP released by El Toro Records. Side A starts with a cover of Hank Snow’s 1950 title ‘I’m Moving On’. 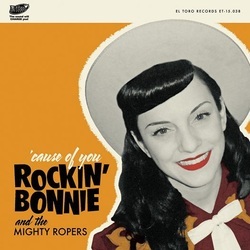 It’s a jaunty, brisk tune that while staying close to the original, has a vibrant sound with Bonnie’s vocal delivery. The accompaniment of the Mighty Ropers is first rate, and the quality of Sergio Panigada’s steel guitar playing is particularly evident on the title track ‘Cause of You’. This is a gentle Country Ramble that is a pure delight, and the first of the original tracks penned by lead guitarist Max Zampini and Sabrina Cocciolo (ie Bonnie). Flip the record over and check out the cover of Hardrock Gunter’s ‘I’ve Done Gone Hog Wild’. Another great Hillbilly-Country bopper this, with a catchy beat and varied solos. Rounding off we have the second of the original tunes, ‘If There’s Any Justice’ which is so well crafted lyrically, it could have come straight out of the early 1950’s. A truly excellent track on an exceptional 7” single release. Swingin’ Records, part of Pink ‘n’ Black Records have released a brace of 45rpms aimed directly at the dancefloor with four excellent tracks. 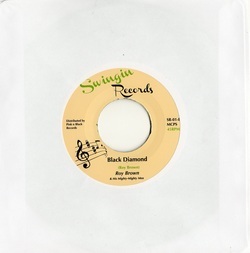 The first features Black Diamond by Roy Brown and His Mighty-Mighty Men, an exceptional vocal performance by Roy set to a catchy quick jive beat. First released on King records in 1954, it’s an absolute classic blues shouter. The flip side features the curiously named Mr. Sad Head and the brilliant ‘Butcher Boy’ from 1950. Cited as the stage name for William A. ‘Sunny’ Thomas/Thurman, the backing is provided by Billy Ford and his Orchestra. A fantastic vocal delivery again in the ‘shouting’ style and a first class jiver. The ‘B’ side combines the great Frank Sinatra’s vocal delivery with steel guitar and toe tapping percussion on ‘Tennessee Newsboy Blues’. Originally released on Columbia Records, this track has a great stroll beat, and has been largely unheard until recently. Listen out for this track at a gig near you. Two 7” vinyl releases, essential for collectors and enthusiasts, perfectly collated for dancers. Continuing the series, Hip Shakin’s Rhythm ‘n’ Soul catalogue maintains high quality output with two stroll beat floor fillers. The ‘A’ side features the irrepressible Wanda Jackson’s ‘Funnel of Love’, written by Charles McCoy and Kent Westerberg, originally released in 1961. Already well known as a dance floor stroller, this is the ‘original’ and many may say, best, version from the Queen of Rockabilly. The ‘B’ side might be a surprise to many, but bear in mind the label is about Rhythm and Soul and Dorothy Williams’ ‘Watchdog’ has a foot in both camps. Released originally on Volt records in 1964, it has that R&B beat with a soulful twist, that fans of the mid-sixties sound will undoubtedly enjoy. 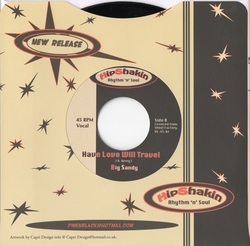 Well packaged 45rpm 7” single with eye catching artwork by Capri design. Cactus records have released a 45rpm single containing two of the hottest Rockabilly tracks. In an homage to the days of single releases, you get an A and a B side to this release, although both vie for top billing. The ‘A’ side is a beauty, ‘I’m Hungry For Your Lovin’ by Danny Dill, with it’s fine reverb on the lyrics, great bopping beat and catchy guitar licks, it captures the spontaneous beat of 1956 Rockabilly. The ‘B’ side could basically be described as a Rockabilly classic. Wayne Walker’s ‘All I Can Do Is Cry’, again from 1956, has a fine back bass beat and also features excellent guitar work. Again, a seminal classic. Two of the finer examples of the genre on one 7” record! Carl and the Rhythm All Stars ‘Drunk Lonely Man’ is a fitting Wild Records ‘A’ Side to this 45rpm single. It has everything that good Rockabilly should be, a frantic but controlled vocal performance and great guitar licks set to a driving rhythm. Flip the record over and enjoy more of the same with ‘Take Your Time’, a definite out and out post midnight bopper, with a cool riff and crashing drum beat. ‘Wild’, it certainly is, and an excellent release. If ever there is a band that encapsulates the Wild Records Rockabilly sound, it would be Dusty Chance and the Allnighters. This 45rpm single, ‘Hex on my Heart’ b/w ‘Chicken Bop’ is straight ahead, no nonsense Rockabilly in it’s most primitive and glorious style. ‘Hex On My Heart’ is set to a can thrashing back beat, with a catchy guitar riff and breathless vocals. ‘Chicken Bop’, like the ‘A’ side, is another self penned track by lead singer Dusty, and does exactly what it suggests, describing headless chicken confusion over romance, to a great beat. Canadian piano pumping professional Israel Proulx’s single release ‘Le Rock ‘n’ Roll Dans Se Lit’ b/w ‘Come On Baby’ is a treat for those into this variety of Rock ‘n’ Roll. The style, unsurprisingly is very much of the Jerry Lee school, but with the twist of Israel singing in his mother tongue, French on the ‘A’ Side. This does not detract from the quality of the track with scorching instrumental breaks. Turn the record over and enjoy a slightly slower paced but equally effective ‘Come On Baby’. This is a great jiver which displays Proulx’s versatility as a vocalist, performing in English. First class. There’s some excellent Rhythm and Blues to be found on Alex Vargas’ single release. ‘Mean Ol Frisco’ is a terrific ‘A’ side mixing a solid back beat with harmonica wails and well performed vocals. The ‘B’ side ‘Bad Mouthing’ is in the same vein, and has the classic Blues style lament set to a cracking blues bopper beat. Again the harmonica is featured heavily, making for an over all heavenly R&B experience. Wild Records have signed an exceptional talent from Canada in Lew Phillips. Utilising just acoustic rhythm guitar, lead guitar and upright bass, he sings in a style similar to a fusion of Buddy Holly, Ricky Nelson and Ritchie Valens. Writing his own material, the influences are clear on hearing ‘Mister Colter’ (miss spelled as Coulter on the label) which has a feel of Buddy’s ‘Early in the Morning’. ‘Mister Colter’ is an incredibly well crafted tune, and has that authentic feel from the mid ‘50’s. The ‘B’ side ‘Silent Love’ is an atmospheric ‘Poor Little Fool’ style love song, with a similar chord progression. A must have 45rpm, from an artist who must have the brightest of futures ahead.